Before battling Superman and joining the Justice League, the Caped Crusader was under the direction of movie maestro Christopher Nolan and Blade (1998) writer, David S. Goyer, in the epic Dark Knight Trilogy, which is still the best thing to happen to the character. In this Rewind Review, we journey back to 2008 to take a look at the best of the bunch, The Dark Knight. The Dark Knight is the follow-up to Batman Begins (2005), and sees billionaire Bruce Wayne continuing his fight against the criminal underworld as masked vigilante, Batman. But nothing can prepare him for the rise of the Joker, an unstable force of nature that pushes Batman towards confronting the consequences of his actions. Co-written by Christopher Nolan and David S. Goyer, the movie plays out like a crime thriller, rather than a superhero film, with Batman attempting to thwart a psychopathic terrorist in clown makeup that knows exactly which buttons to press. Christian Bale returns as the Dark Knight and continues his brilliant performance to near perfection. He manages to bring all three of Bruce’s personalities a sense of realism, whether that’s as Bruce Wayne in the public, the real Bruce with Alfred, and of course, Batman himself. This time around, Bale brings gets to explore a more fragile side to the character, stepping away from the anger of Batman Begins. His relationship with Alfred feels deeper, and even provides a few laughs, but not as many as the films antagonist. The Clown Prince of Crime is played by the late Heath Ledger, who won a post-humus award for his performance. Though we learn very little of who the Joker actually is, he more than makes up for it with a terrifying appearance and an unpredictability that sets the audience on edge whenever he’s around. This Joker is less concerned with making jokes than he is causing chaos on the streets of Gotham in an attempt to show just how mad the people really are, whether he’s threatening to blow up boats or pushing someone way beyond breaking point. As he explains, he’s a “dog chasing cars” just doing things because he can. In a welcomed return, both Michael Cain and Morgan Freeman reprise their roles as Bruce’s trusted butler Alfred Pennyworth, and head of Wayne Industries and tech provider, Lucius Fox. There’s also a handful of new additions to the cast, with Maggie Gyllenhaal taking over as Rachel Dawes, and while she’s a welcomed addition, her character doesn’t have much to do and only serves as a plot device for certain events to move forward. And finally, Aaron Eckhart is introduced as Harvey Dent, a district attorney on the edge of breaking point. His introduction is brilliant a sets him up as a man to be trusted, “the face of Gotham’s future.” But after a terrifying interrogation scene, it becomes apparent that he’s not a stable as one would think. The story starts off relatively normal with Batman focused on the mob, continuing the continuity from the animated movie Batman: Gotham Knight, before the Joker arrives on the scene. With the mob becoming desperate, they begin to turn towards the Joker and his extreme methods. The only issue with the story is its focus, cutting between Batman’s story arc and the Joker’s dealings, making this less so a Batman movie and most of a Batman/Joker film. This isn’t a bad thing by any means and gives Heath Ledger more time to shine. The story continues to build up and intensify as the Joker slowly becomes more influential, providing some expertly played twists and turns until the shocking finale where anything could happen. The action increases pretty significantly as well and it is nothing short of spectacular. From the expertly crafted opening heist to the pulse racing car chase, the action feels grounded but has a grand scope to it where the entire city feels at risk of being sucked into the madness. As the story and the action heats up, the tension is pushed to extremes, with it becoming unclear whether Batman or the Joker will succeed. It’s pushed to breaking point as the two meet for the movies best scene, with the Joker being interrogated by Batman while trying to explain how he sees the world and how similar they both are. It’s at this point that parents realised that this is definitely not the Adam West or Tim Burton era, with the film pushing a 12A certificate beyond what is suitable. In many rereleases, The Dark Knight Trilogy is now officially a 15, which is a much better choice. Writer and director, Christopher Nolan, has made a name for himself as the thinking man’s director, crafting intriguing plots that draw you in and always leave everyone surprised. He also utilises symbolism effectively in this film to help convey messages about characters mental stability and the overall tone, which is only heightened with the epic soundtrack. Back from his work on Batman Begins, Hans Zimmer creates the score and manages to outdo everything he previously created. 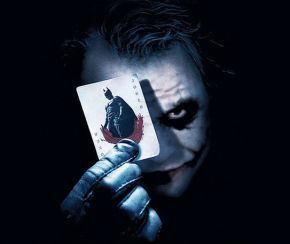 Utilising the theme from the first movie and shaping it into something different, it is a masterpiece, with a highlight being the themes for both Joker and Harvey Dent. It’s quite easy to say that The Dark Knight changed the way that Warner Bros and DC developed their films, but it goes much further than that. Lots of filmmakers realised they could take their stories seriously and not need to water everything down to suit a younger demographic. Unfortunately some have taken this as “everything needs to be dark”, rather than be respectful of the source material and capture the spirit of the character. Overall, this is easily one of the greatest adventures for the caped crusader and one of the best films ever made. With a gripping story, amazing actors and an incredible score, The Dark Knight managed to break out of the sequel curse and raised the bar for comic book adaptations, and movies, could be. Purple Revolver rating: 5/5. An absolute masterpiece.